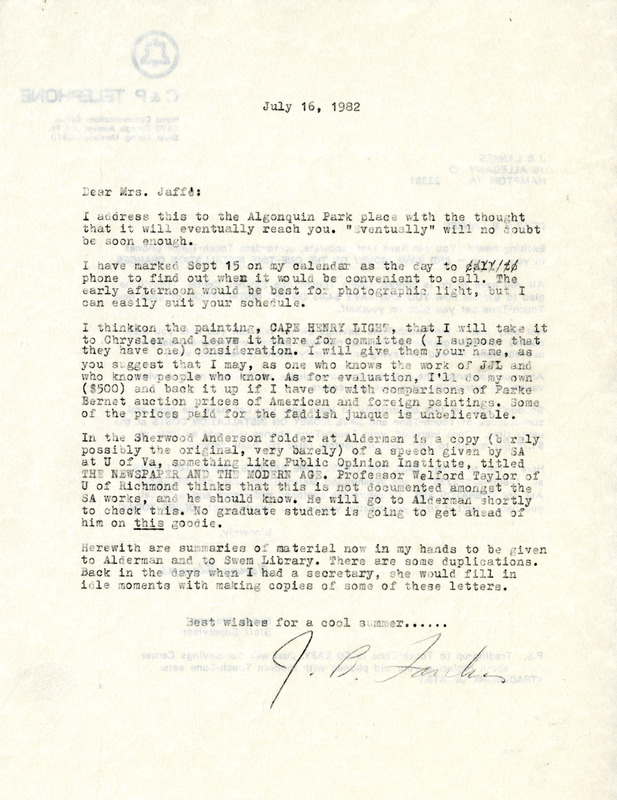 Letter from Lankes to Jaffe about at day/time for Lankes to visit, the dispostion of the Cape Henry Light painting, and an apparently undocumented Sherwood Anderson speech in the papers at UVA. Lankes, J. B. (Julius B. ), 1915-2010, “Letter, J. B. Lankes to Alice Jaffe, July 16, 1982 (Ms2019-014),” VT Special Collections Online, accessed April 23, 2019, http://digitalsc.lib.vt.edu/Ms2019_014_JaffeLankes_/Ms2019_014_JaffeLankes_B1F5_LankestoJaffe_1982_0716.